Birmingham eased their Premier League relegation fears with victory over Sunderland, who slumped to their eighth defeat in nine games. The Blues took the lead just before half-time when Sebastian Larsson made the most of a defensive mix-up between Simon Mignolet and Phil Bardsley. Craig Gardner made it 2-0 with a low 20-yard drive into the bottom corner. Sunderland came closest to scoring through Stephane Sessegnon, who had a shot cleared off the line. They also created chances for Jordan Henderson and Bardsley, but once again Sunderland, who scored for the first time in four games last weekend, found it difficult to find the back of the net. That profligacy in front of goal, grouped with a string of injuries to key players and a run of bad results, means that Sunderland face a tough task to retain their top-flight status despite holding a five-point cushion on the bottom three. The Black Cats were forced to field their youngest-ever starting XI in the Premier League - at an average age of 23 years and 311 days - as a result of the host of injuries. At the back they were missing Titus Bramble and Anton Ferdinand while midfielders Sulley Muntari and Kieran Richardson were also sidelined. With first-teamers missing, the last thing an inexperienced outfit would have wanted was to concede early, but that nearly happened in the second minute. Lee Bowyer launched the ball down the left leaving team-mate Cameron Jerome to contest possession with Michael Turner. The Blues forward easily accelerated past his marker and fired in an angled low shot that Mignolet did well to save with his feet. The Wearside club responded well and created two opportunities in the space of 30 seconds when Lee Cattermole robbed the ball from Barry Ferguson 20 yards out but saw his subsequent low effort blocked by Ben Foster. The Blues keeper was then rescued by team-mate Roger Johnson who got in the way of Stephane Sessegnon's follow-up shot. Moments later, Stephen Carr made a vital interception to prevent Sessegnon from converting Danny Welbeck's dinked ball from the right. Sunderland looked good value for at least a 0-0 scoreline at the break, but bad luck, with a sprinkle of calamity, struck the beleaguered side again. On this occasion, Foster's punt downfield was flicked on by Jerome. Larsson made a beeline for the loose ball which either Bardsley or Mignolet looked favourite to clear. However, neither did and instead looked at each other accusingly as the Swede's shot flew in. Sunderland promised much again after the break, with one-touch link-up play between Asamoah Gyan and Danny Welbeck resulting in Jordan Henderson's 18-yard curling effort which brushed the wrong side of the netting. Bardsley went even closer when his fierce deflected 25-yard drive looked goalbound until Foster dived to his right to deny the defender. But as in the first half, Sunderland conceded again against the run of play. Substitute Alexander Hleb, who had been on the pitch for less than five minutes, danced around a couple of challenges before feeding Gardner, who looked up once before striking a powerful low shot that Mignolet could only palm into the net. Sunderland continued to launch balls into the Birmingham area but the home defence coped admirably. The closest the visitors came to scoring in the last 20 minutes was when Henderson's shot from eight yards was blocked by the boot of the impressive Johnson. The win takes the Blues to 38 points and 14th spot, above Sunderland on goal difference. "The opening goal typified our character and spirit. Larsson has been instrumental and an inspiration. "Another win would take us close to where we'd like to be. But in this league you can't bank on anything." "We have to try and take the positives out of today and if we play like that, we can still turn the season around and finish with a flourish. "We are in it (a relegation battle), no question about it. There are 10 teams in it and we are one of them. "The lads know we have not got enough points. We have one point from nine games and we've got to try and arrest that slump." "We've now got back-to-back home games with Wigan and Fulham so it is an opportunity to put things right. "Maybe 41 points will be enough to stay up. One win might do it. I think so." 90:00+4:01 The referee ends the match. 90:00+3:17 Shot by Matt Derbyshire from deep inside the penalty area misses to the right of the goal. 90:00+1:15 Lee Cattermole fouled by Keith Fahey, the ref awards a free kick. Jordan Henderson crosses the ball from the free kick right-footed from left wing. Correction - 89:18 Substitution Matt Derbyshire replaces Cameron Jerome. 89:18 Substitution Cameron Jerome leaves the field to be replaced by Jordon Mutch. 87:57 Asamoah Gyan concedes a free kick for a foul on Roger Johnson. Direct free kick taken by Ben Foster. 87:18 Substitution (Birmingham) makes a substitution, with Keith Fahey coming on for Sebastian Larsson. 82:06 The referee blows for offside against Asamoah Gyan. Indirect free kick taken by Ben Foster. 80:46 Free kick awarded for a foul by Phillip Bardsley on Alexander Hleb. Barry Ferguson restarts play with the free kick. 80:01 The ball is delivered by Steed Malbranque, Ryan Noble produces a right-footed shot from inside the area that clears the bar. 76:22 Michael Turner fouled by Alexander Hleb, the ref awards a free kick. Lee Cattermole takes the free kick. 75:40 Substitution Jack Colback goes off and Steed Malbranque comes on. 75:40 Stephane Sessegnon has an effort at goal from the edge of the area that misses to the right of the target. 74:37 Corner taken by Sebastian Larsson. 73:45 Asamoah Gyan has an effort at goal from outside the penalty box which goes wide right of the target. 71:23 Phillip Bardsley takes a shot. Sebastian Larsson gets a block in. Outswinging corner taken by Jordan Henderson, Roger Johnson makes a clearance. 69:59 Substitution Danny Welbeck goes off and Ryan Noble comes on. 69:00 Craig Gardner gives away a free kick for an unfair challenge on Jack Colback. Phillip Bardsley restarts play with the free kick. 67:55 Alexander Hleb is caught offside. Indirect free kick taken by Simon Mignolet. 66:50 Unfair challenge on Barry Ferguson by Lee Cattermole results in a free kick. Ben Foster restarts play with the free kick. Correction - 65:46 GOAL - Craig Gardner:Birmingham 2 - 0 Sunderland Craig Gardner fires in a goal from long distance to the bottom left corner of the goal. Birmingham 2-0 Sunderland. Correction - 65:46 Assist on the goal came from Alexander Hleb. 65:46 Assist by Alexander Hleb. 65:46 GOAL - Craig Gardner:Birmingham 2 - 0 Sunderland Goal scored by Craig Gardner from 30 yards to the bottom left corner of the goal. Birmingham 2-0 Sunderland. 65:26 Asamoah Gyan gives away a free kick for an unfair challenge on Liam Ridgewell. Direct free kick taken by Ben Foster. 64:31 Sebastian Larsson delivers the ball, Simon Mignolet makes a save. 63:43 The ball is sent over by Jordan Henderson. 63:24 Ahmed Elmohamady crosses the ball, clearance made by Liam Ridgewell. 60:57 Substitution Alexander Hleb comes on in place of Kevin Phillips. 60:57 Michael Turner challenges Cameron Jerome unfairly and gives away a free kick. Direct effort from the free kick comes in from Craig Gardner. 60:29 Phillip Bardsley delivers the ball, Ben Foster makes a save. 59:39 Free kick awarded for an unfair challenge on Michael Turner by Kevin Phillips. Free kick taken by Simon Mignolet. 57:20 Corner taken right-footed by Jordan Henderson from the left by-line, Michael Turner takes a shot. Save by Ben Foster. Outswinging corner taken right-footed by Jordan Henderson from the right by-line, Danny Welbeck takes a shot. Roger Johnson gets a block in. Inswinging corner taken right-footed by Jordan Henderson, Foul by Phillip Bardsley on Liam Ridgewell, free kick awarded. Ben Foster takes the free kick. 55:25 Shot from just outside the box by Asamoah Gyan goes over the crossbar. 54:52 Lee Cattermole takes a shot. Ben Foster makes a save. 54:37 Phillip Bardsley sends in a cross, Barry Ferguson makes a clearance. 53:46 Centre by Jordan Henderson, clearance by Barry Ferguson. 53:13 Free kick awarded for a foul by Kevin Phillips on Phillip Bardsley. Free kick taken by Nedum Onuoha. 52:18 Jordan Henderson concedes a free kick for a foul on Lee Bowyer. Ben Foster takes the free kick. 50:40 Jordan Henderson produces a right-footed shot from just outside the box that misses to the right of the goal. 49:41 Stephane Sessegnon produces a cross, clearance by Barry Ferguson. 47:53 Sebastian Larsson takes the outswinging corner, Roger Johnson has a headed effort from close range and clears the crossbar. 46:55 Jordan Henderson produces a cross. 45:18 Danny Welbeck has shot on goal from just outside the area which goes wide of the right-hand upright. 45:00+2:34 The match has reached half-time. 45:00+0:54 A cross is delivered by Asamoah Gyan, Jordan Henderson concedes a free kick for a foul on Lee Bowyer. Free kick taken by Ben Foster. 44:58 Effort on goal by Craig Gardner from just inside the area clears the crossbar. 44:50 Sebastian Larsson delivers the ball, clearance by Michael Turner. 42:26 Effort on goal by Asamoah Gyan from 18 yards. Save by Ben Foster. Corner taken by Jordan Henderson from the right by-line, Nedum Onuoha produces a header from inside the area that goes over the crossbar. 41:31 The ball is swung over by Phillip Bardsley, clearance made by Stuart Parnaby. 40:08 The assist for the goal came from Cameron Jerome. 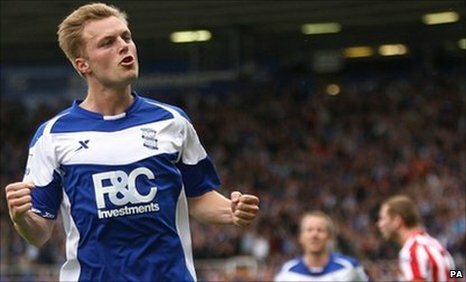 40:08 GOAL - Sebastian Larsson:Birmingham 1 - 0 Sunderland Goal scored by Sebastian Larsson from just outside the box to the bottom right corner of the goal. Birmingham 1-0 Sunderland. 37:17 Inswinging corner taken by Jordan Henderson, clearance by Stephen Carr. 36:42 Free kick awarded for a foul by Kevin Phillips on Nedum Onuoha. Free kick taken by Simon Mignolet. 35:25 The ball is crossed by Asamoah Gyan, Stephen Carr manages to make a clearance. Corner taken by Jordan Henderson from the right by-line, clearance by Craig Gardner. 34:10 Long range effort by Phillip Bardsley goes wide right of the net. 34:04 The ball is swung over by Ahmed Elmohamady, clearance made by Sebastian Larsson. 32:33 Inswinging corner from left by-line crossed in by Jordan Henderson, Craig Gardner manages to make a clearance. Corner taken right-footed by Jordan Henderson to the near post, Jack Colback takes a shot. Blocked by Barry Ferguson. 29:02 The ball is delivered by Sebastian Larsson, clearance made by Nedum Onuoha. 28:35 Stephane Sessegnon produces a cross, clearance by Liam Ridgewell. 25:43 Foul by Craig Gardner on Phillip Bardsley, free kick awarded. The free kick is delivered right-footed by Jordan Henderson from left wing, clearance made by Roger Johnson. Unfair challenge on Stuart Parnaby by Danny Welbeck results in a free kick. Ben Foster takes the direct free kick. 24:35 Craig Gardner takes a shot. Michael Turner gets a block in. 23:28 The ball is swung over by Stephen Carr. 21:37 Danny Welbeck concedes a free kick for a foul on Barry Ferguson. Sebastian Larsson crosses the ball from the free kick right-footed from left wing, Phillip Bardsley makes a clearance. Corner taken right-footed by Sebastian Larsson from the right by-line, clearance made by Asamoah Gyan. 16:54 Nedum Onuoha produces a cross. 14:17 Stephane Sessegnon takes a shot. Blocked by Roger Johnson. 13:17 The official flags Kevin Phillips offside. Simon Mignolet takes the free kick. 12:59 Sebastian Larsson crosses the ball, clearance by Ahmed Elmohamady. 5:10 Sebastian Larsson takes the inswinging corner, Roger Johnson has a headed effort at goal from close in which goes wide right of the goal. 4:43 The ball is delivered by Kevin Phillips, clearance made by Ahmed Elmohamady. 2:16 Kevin Phillips is ruled offside. Free kick taken by Simon Mignolet. 1:53 Craig Gardner takes a shot. Michael Turner gets a block in. 1:29 Cameron Jerome takes a shot. Simon Mignolet makes a save.